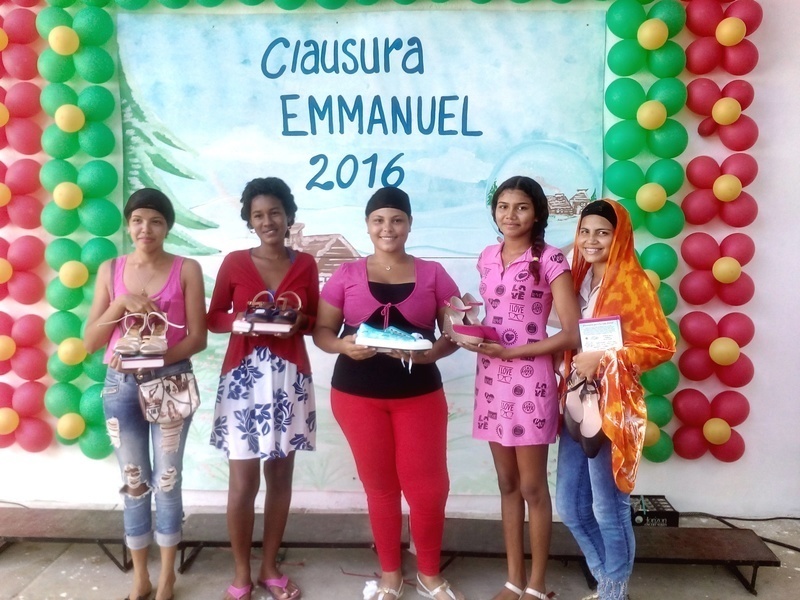 At our Emmanuel Care Centre in Colombia we have the privilege of supporting Guacamayal’s poorest children with homework help, regular food and medical care. The children in our care attend local government schools, but without the help of Stand by Me to purchase educational resources such as pens, pencils, exercise books and school bags, many would not achieve their educational aspirations. Five of our girls; Jeraldinis, Yuranis, Guissett, Adriana and Margarita, recently completed their High School education. This is a fantastic achievement for these five young women and one worth celebrating. The care centre held a special tribute to celebrate their time in our programme and congratulate them for doing so well at school in front of all of our care centre children and staff. Each girl received a Bible with a personal message inscribed, a pair of shoes and a gift of jewellery. Jewellery is a favourite of our girls and a real treat. It was a greatly timed gift as we celebrated on the day that they were preparing for their graduation ceremony later that evening. A few of the girls had they hair covered or in rollers as they wanted it to look lovely for their graduation ceremony. We want to thank of all our Colombia supporters as our five girls would not have been able to get to this point in their education without your help to fund their educational needs and the care centre that has supported them with food, medical help and counselling. We couldn’t be more proud of these five brilliant young women. All around the world, Stand by Me projects celebrate occasions in their own way. In Colombia at Easter time, families share in a tradition of baking sweets and giving them to their relatives and neighbours to spread joy. In 2012 Chris and Fi made their first visit to Ethiopia, little did they know that this short trip would be the catalyst for them, in 2017, to move hundreds of miles away from their home to live in Bekoji, one of the poorest towns in Ethiopia.